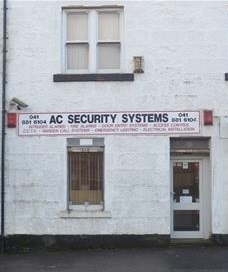 Established in 1977 as AC Security Systems. We moved to our current premises at 34 Main Street, Barrhead G78 1RE in 1980. We gained our quality assured status from NSI / NACOSS in 1996. Having previously been an NSCIA approved installer. Our customer base is diverse, ranging from large companies, Local Authorities, NHS, family businesses, to the domestic market. We are an approved Installer, enrolled on the register of the National Approved Council for Security Systems (NACOSS GOLD) and accreditation to ISO 9000 Quality Assured, the international quality standard. We provide a 24-Hour, 365 Days a year emergency service. We are constantly reviewing our customer maintenance plans, believing this to be the best way to offer satisfaction to our customers in all areas of our Contracts. Only the highest quality equipment is sourced at competitive prices which we believe offers our customers a quality installation at a fair price, coupled with after sales care that is second to none. This is a family run business with a strong Management Team with over 30 years experience. The owners, Sandy Connolly and his wife June, together offer a personal service that we believe is very important to the client, particularly in today’s world of faceless organisations. We believe that the high quality of our workmanship, products and customer satisfaction have been the main factor of our success.